Covert narcissists have been referred to as vulnerable or inverted narcissists. Do we really need 3 labels for this one type of narcissist? I think not. A covert narcissist is the same as the vulnerable/inverted. Covert narcissists are known to be much harder to identify than overt, grandiose, feeling superior larger than life (legends in their minds) narcissists. The covert narcissist is still difficult in many instances to expose up close and personal. Many people realize after years that their mother or father, or a sibling, or an an adult-child is, in fact, a covert narcissist. This helps minimally in terms of coming to understand the pain you’ve been in and the trauma that you have suffered. While not always at all easy to spot, certainly not for while in all-too-many cases for narcissistic abuse survivors is the covert narcissist. The covert narcissist, exposed, here, is my specific reference to how “deflated” these narcissists are. They are on the opposite end of the “spectrum” so to speak in comparison to the overt narcissists at the other end of it who are “inflated”. Because covert narcissists are left defective and deflated by their original intra-psychic narcissistic injury/injuries, this is why they are very less obvious and very difficult to identify. They are the consummate and penultimate martyr victims for a narcissistic supply very differently sought after. The covert narcissist is “deflated”, not grandiose or as cocky and arrogant, outwardly, as the overt legend in his/her own mind type of narcissists. Overt narcissists by way of their illusions of such supposed (they think anyway) superiority to everyone else, do not have as deep a level of pathological envy as the deflated, vulnerable, defective covert narcissists have. It is the degree to which the deflated defective covert narcissist is drowning in and/or awash with pathological envy that makes them and their manifestation/presentation of narcissistic abuse often much more dangerous than most overt narcissists mainly because it can go undetected for way longer and people end up more traumatized by the time they figure out who/what their so-called “loved one” really is. Pathological envy is the core of the original narcissistic injury, that is primal hatred, that they present differently and that in many ways, psychologically, emotionally and sometimes physically. Whether a narcissist is covert or overt none of them escape some degree of pathological envy – this primal hatred that they, living only through a false self cannot and do not ever evolve beyond the primal hate that is pathological envy. 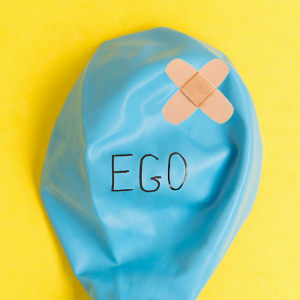 Just a point to be aware of, in healthy, or average non-personality disordered people the terms “inflated” or “deflated” ego have an entirely different meaning. Definitely, they are not to be confused with the state of the fragmented and compromised ego of the narcissist, ironically, since in an overcompensating way, narcissists can seem so arrogant or “egotistical” when really, their egos are damaged beyond rescue or repair. © A.J. Mahari – June 30, 2018 – All rights reserved.